This formation reminded me of a molar tooth. This was one of the lava teeth at "Dragons Teeth". 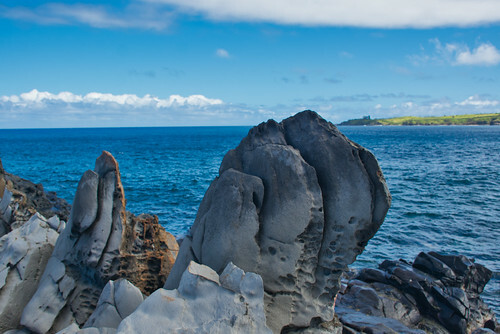 The result of one of the last lava flows on Maui, Dragon's Teeth is a unique rock formation located at Makaluapuna Point in Kapalua on the island’s northwestern shore. Hundreds of years ago, the molten lava that poured from the West Maui volcano was lighter, denser and more fine-grained than other flows on the island, and as it crawled towards the ocean, fierce waves and sea winds sweeping in over the point caused the lava to harden in an upward fashion – causing jagged black points that look like dragon's teeth.